This tutorial is about how to make IP Finder in java with source code. 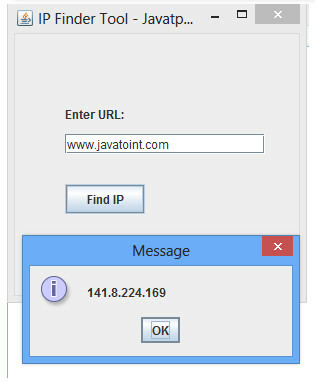 By following this tutorial you can able to make a software for finding your IP Address with Java programs codes. After finished your programs in Java with below codes, you will able to see this image like screenshot appear. You just copy these source code from below and make a soft with Java for finding IP address. When you are done then you just input a web address and press enter. You will see your IP Address which I provide as a screenshot before. If you have any problem in these codes must knock me via the comment section. I will try to solve it. It is helpful? If yes! Don't forget to share with buddies in social media.